Analytical Armadillo: Is Exclusive Donor Milk Feeding Really A Viable Option? Is Exclusive Donor Milk Feeding Really A Viable Option? Something I've seen more and more recently is an increase in the number of people who appreciate donor milk is a better substitute for a mother's own milk, than that of a different species. Donor milk sharing groups online and the discussion that follows - means more are becoming informed as to the differences between human and bovine milk, and potential associated risks of substitutes. The age of the internet and social media also makes information sharing faster and easier than ever before - many are now not only able to access things like research papers and journals, but then share their findings quickly and with a wide audience. This means parents are no longer reliant on what best seller is lining the shelves of their local book shop - instead they have a much better chance of finding evidence based information and making their choices accordingly. "There's no excuse for using formula, donor milk is far superior." "If I couldn't breastfeed I would definitely use donor milk." 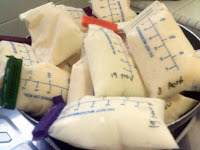 "Why anyone would use formula when they could use donated breastmilk is beyond me. Modified milk from a different species or donated milk, it's a no brainer. I would source donor milk! But how practical is it in reality to exclusively feed your baby with donated breastmilk? I began pondering this more deeply a few months ago at a weekend Milk Matters Clinic. A mum early in the day came and brought with her a full carrier bag of frozen breastmilk, which was to be collected by a friend of hers who was attending later in the day. .As I popped it in the freezer I marvelled at bulging bag after bag of milk this mum had generously agreed to share. Later in the day said mum arrived, I handed over the milk and she said how thankful she was etc - how this now meant she had milk until Wednesday. Bearing in mind it was already Saturday, I looked at what appeared to be a vast amount of milk and realised if that is feeding baby exclusively - indeed such an impressive stash was just a short few days worth of nutrition. The mum was extremely grateful, but it struck me that it must be really difficult to be frantically trying to arrange enough food for your baby, knowing after X days you would run out if more couldn't be found. Now consider the typical breastmilk bag holds around 6oz of milk, the consider that a baby can take anywhere up to say 35oz per day. That's 6 bags per day. Any mum who has expressed may now be starting to realise the implications of this. Even if a mum expresses 8oz in one sitting, she would need to do that 6 times per day to supply another mum. Most mums donate excess breastmilk they may collect once or twice per day - expecting a mum to fit 6 expressing sessions is a big ask, especially longer term. This means that realistically one baby needs multiple donors - perhaps up to 6 or 7 if mum only has a few oz per day extra, more if logistics mean collection isn't always reliable, or to ensure there is enough if someone goes on holiday or gets sick. One mum I spoke to recently expressed her frustration at comments online that suggested obtaining breastmilk was as easy as just asking, and that despite a genuine medical necessity the breastmilk bank could not help her either as her baby wasn't premature. The other issue is this mum would prefer to have access to tested & pasteurised milk from her milk bank, or be able to flash pasteurise the milk at home (if the milk hadn't come from someone she knew, or a friend of a friend or suchlike). However receiving frozen donor milk which is the norm, makes this very difficult as you can't refreeze the milk - hence it would need to be thawed and then flash pasteurised before each feed, hardly practical with a baby and older toddler. Q. How old is is your baby now and what percentage of milk requirements are fulfilled with donor milk? A. My baby is 4 1/2 months and typically needs 25-30oz per day of milk (whether that's donor or formula). Q. What is the emotional/psychological impact of having to introduce formula when you wanted breastmilk, and of being reliant on others?A. When I have to feed formula it makes me sad & angry - this is something I should be able to do myself, but I can't and there is no formal support for me (even my GP asked me where I got donor milk from and had never heard of a Lactaid!) . I have a baby who gets a rash on her forehead when I give her formula, but I have no option but to do so to give her nourishment. I avoid the GP and use natural remedies to try and treat it, but within hours of formula it gets red & angry - I know how to fix it, but I can't - makes me feel inadequate, frustrated, sad and a useless mother. I feel I'm letting my baby down, but friends & family don't understand, nor do most breastfeeders or non breastfeeders. Why isn't the NHS doing more? Whilst years ago some actually believed formula was superior to breastmilk, the NHS and all other World Health Authorities now recognise this is not so. They advise mothers that they should breastfeed for 6 months, they sometimes disclose the risks of not doing so - yet when the NHS cannot resolve breastfeeding issues for a mother, why are there no systems in place for her to have the option of obtaining human milk? Why is she then advised to use bovine milk? One minute she is being told "breast is best", another she finds herself in a situation with no alternative but to use a replacement. If formula wasn't an easy option, would the government be allowing babies to die, or would they have ensured better breastfeeding support and sharing networks? 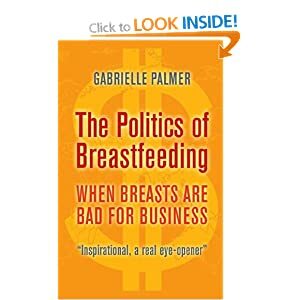 As things stand there is not only an easy alternative, but as The Politics Of Breastfeeding discusses the NHS also receives "donations" from substitute manufacturers. In contrast breastmilk is relatively expensive to store, pasteurise etc; according to Baby Milk Action the cost of breastmilk is 130 Euros per litre. Unfortunately this doesn't really offer much in the way of an incentive to change. But scratch a little deeper and the picture is different. In the UK, a NICE costing report evaluated possible savings from being awarded Baby Friendly Initiative accreditation. They said. “The evaluation assumes that a 10% improvement in initiation rates is a realistic target. • about 17,000 cases of otitis media avoided at a saving of £509,000. • over 1500 cases of asthma being avoided, at a saving of £2.6 million. Hmmmmm yet don't forget "Breast Is Best" right? Can we hardly blame mums for not being convinced by this flaky message (breast isn't best it's just the normal food a human infant is supposed to eat) and contradictory practice. If the hospital is giving out formula, how bad can it be right? If all the mums that say they would use breastmilk, donated when they had their baby, and if the NHS included donation and sharing details in their antenatal classes - perhaps we could go some way to provoking a change? To trying to facilitate a reliable supply for mothers who have a genuine medical need, and appropriate effective breastfeeding support for those who are having problems due to ineffective help, that could be rectified. Those are good points and it is certainly not easy for parents to exclusively feed donor breastmilk for even 6 months, let alone longer even though it does not necessarily have to be exclusive from then on anymore. It really will take the whole professional community to support community milk sharing, and to enable affordable testing for it to be done safely. 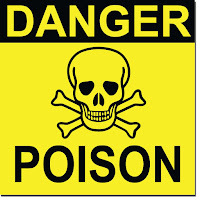 Parents can be educated about proper pasteurization if need be as well. It would be safer to pasteurize at home I think then having the milk be pasteurized somewhere else and then potentially be exposed to pathogens till it is used. I agree that lactation support is often lacking, expensive for many, at least in the US, and that most of the work is best done antenatally. I do think that we are on our way to changing things though :-) Baby steps but still. We are constantly looking over the latest research. We are, on a daily basis, fact checking, verifying studies, reaching out to health professionals and scientists to ensure that the information regarding health and safety is accurate, unbiased and up to date. More and more professionals are seeing how milk sharing can be done safely and support it wholeheartedly, especially among the lactation professionals. Just some thoughts that came to mind. I could talk about this all day! I definitely think there is this prevalent idea in the breastfeeding community that donor milk is an easy thing to get a hold of. I've also seen many, many comments of the same variety. Like, "Donor milk, duh!" I have a 9 week old daughter and we've been extremely lucky that we haven't had to supplement her with a drop of formula yet. She's been on exclusively breast milk. About %15 from me, the other %85 from donor milk. (She takes around 24 oz's of donor milk a day) But what does that mean in terms of work on my part? *Finding 15 donor moms - I'm thankful for every one. I've picked up as little as 10 oz's and as much as 2000 oz's. *Over 600 miles driven - with a newborn and 3 year old in tow, I don't even know the gas I've spent on this. *Countless hours spent trolling Eats on Feets, HM4HB's and Milkshare. Donor milk gets snatched up quick! You have to be aggressive and *fast* to be the chosen "donee". *Countless hours responding to e-mails, following up on requests, sending out feelers, and sending out thank you follow ups. I know it sounds silly, but it takes time! *I'm a children's photographer, and have committed to taking family portraits for four donor moms in exchange for their pumping for me. That's about 80 hours of work for me. On top of that, to even be able to produce the small amount of milk that I do, I spend around $200/month on supplements and 2 hrs/day pumping. I wouldn't change it for anything! When my son was born four years ago, donor milk wasn't even something I knew existed. But it's a time sucker, a money sucker, and an energy sucker. Formula would be ridiculously cheaper and easier to obtain. You hit the nail on the head! But it's all worth it!!!! It is so awesome you can offer a photo session in trade for the milk! My best friend is a photographer and I know it's a lot of work. My son has had FORTY-TWO moms donate milk to him over the course of 15 months. He was around 3 months old when we received our first donation and we never had to use formula again. We were incredibly blessed that we were able to locate milk for so long. I have driven at least a thousand miles, spent hundreds of dollars in gas, and so much time and effort "hunting" down milk. My son is turning 19 months old next week. We will run out of donor milk in the next two days or so. He's been weaning to Flax Milk due to a sensitivity to dairy. He was exclusively donor fed for 10 straight months. When he was 13 months old I tried to wean him to cow milk, but he had a reaction, then I tried goat milk and that wasn't working either. After 3 weeks of watching him suffer and trying different milks I decided to continue donor feeding until I could find a suitable alternative for him to wean to. I managed to get him milk for 4 more months. The fact that he was exclusively donor fed for 10 months astonishes me every time I think about it. You are right when you said that if every woman who can breastfeed could donate, more and more babies could be as blessed as my son has been. Our story is here in two parts. I am here to say that it is possible :) 38 women from 5 states have shared their milk with my little guy who was (almost) exclusively fed donor milk until the day he turned 19 months! It took (as someone mentioned already) time, resources, and many miles driven, but it was SO worth it and I would not change a thing! I have chronicled my milk-sharing journey on my blog, over at www.supermommysometimes.blogspot.com, if you would like to read a little more :) There were up's and down's and times when there seemed like more requests for milk in my area than donors, but we managed to get through only supplementing very short term (when we did at all). It has been quite an amazing journey and literally restored my faith in humanity at seeing the selflessness and generosity of the mothers who were able to donate to our family! I would like to add that the element of competition (even when moms are desperately trying to avoid it) can be a hard mental/emotional part of finding donor milk. As my baby got older, I tended to only taking milk after waiting to see if a younger baby needed it (or a baby with allergies/medical reason). But when my son was very small, I remember a lot of feelings of anxiety about being the first to respond to an offer and guilt for that. To be honest, I also felt resentment when someone from out of the area would post for milk when there wasn't even enough for local babies. I hope the practice will become more common and the supply/demand will equal out a bit! I am also here to say that it is possible. Our son is adopted and he's almost 5 months old and has had nothing but donor breastmilk since leaving the hospital. It is possible to find enough milk but it's a part-time job. I don't mind the work in finding the milk and driving to get it because I see how healthy our baby is. His pediatrician is also on board. We get blood work from his donor mums and if they can't provide it we pasteurize. All babies are worthy of receiving donor milk, not just sick babies. And it's a natural flowing resource. If more people were educated as to the benefits and risks there would be enough milk for every child. I just wanted to thank you for discussing this. I am currently trying to get enough do going donors to exclusively breast milk feed my 6 month old. Up until now I have got roughly 2/3 of her requirements from generous milky mamas.. But it's great to see others who have gone through the same lengths as me and succeeded. Not being able to breastfeed my daughter past 5 months (after feeding my son for 20 months) has been so devastating to me. It's great to have this option but it most certainly isn't an easy option. The research, the travel, the coordination for freezing/thawing/storing milk, the money for bags, ice, travel, etc. It is definitely worth it however it is a big commitment from both the donors and those seeking donors.